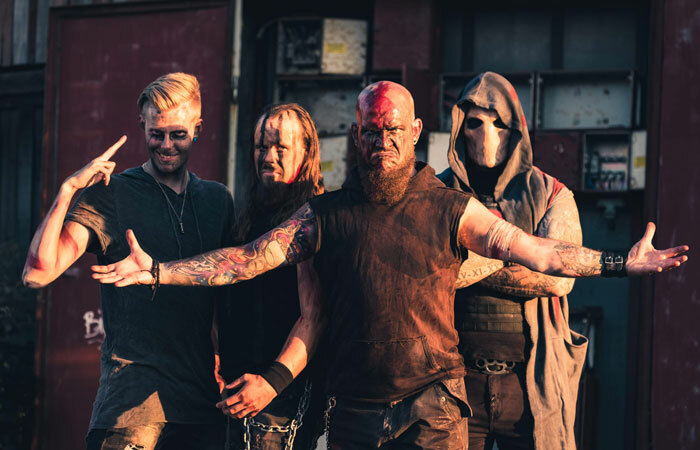 CHUGGER is an energetic groove metal band from Gothenburg, Sweden, successfully fusing Gothenburg's signature death metal with the groove of American southern metal. CHUGGER released their debut album 'Scars' in the winter of 2013, featuring songs 'Art of Science' and a rerecording of the first demo 'Bleed', among others. Following the release, the band voyaged across Europe to promote the album with their 'Scars Over Europe Tour' in 2014. The tour was widely successful and CHUGGER received excellent reviews on their live performances, especially for the energy they displayed on stage. The Disease Tour', which took them across most of Europe, including Spain, Italy and England. In early 2017, CHUGGER released 'Grinder', which was simultaneously released as a video that paid homage to classic horror movies like Texas Chainsaw Massacre and The Hills Have Eyes. Fast forward to 2018, the death machine hit the stages again following the release of their new single 'Through Suffering Reborn'. Some of the concert highlights over the year include Gefle Metal Festival and Wacken Open Air, where CHUGGER unleashed their groove death metal in front of roughly eight thousand screaming metalheads. With brand new material in the tank, you will experience the headbang dealer that is CHUGGER!